There's a Bison T-Rex portable for every basketball game in the arena, side court, small gym and rec center, each with competition styling, glass backboard with lifetime warranty, breakaway goal and DuraSkin backboard padding. T-Rex has low-maintenance, extension spring technology for one-person setup and height adjustment. Front stabilizers lock in place for maximum stability. The competition T-Rex 96 offers 96 inches of safe play area. T-Rex 66 is for side courts, T-R54 SR for competition where space is at a premium, and T-Rex JR is for recreation/physical education. New and improved WoodflexTM sports flooring includes a PU coating for even easier cleaning. The multipurpose sports flooring has an authentic wood look that never needs sanding or refinishing and is now available in four colors: Maple, Oak, Cherry and Blue Tint. WoodflexTM is a hygienic flooring solution that is ideal for multipurpose rooms, gymnasiums, aerobics studios, assembly halls, recreation centers, dance studios and more. The custom-engineered COVERMATE IITM represents a breakthrough in gymnasium safety. The system's main attractions are the retractable outriggers that reduce the risk of tipping. Also, the yellow end collars on each roller prevent fingers from getting pinched between the roller and the roller bracket. Special safety bolts that attach each roller bracket to the main frame hold each roller captive to prevent it from popping up. The six casters, two of which are offset, reduce the floor point load by 33 percent, while foot-operated locks anchor the system securely to the floor. 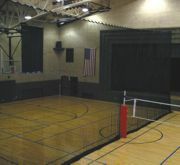 Carron divider nets and curtains allow gyms, fieldhouses and recreation centers to be divided into a variety of combinations to take full advantage of available space. Carron can design netting or mesh-and-vinyl divider systems to suit nearly any floor configuration. Their staff can guide you from design to pricing, usually in one phone call. And with a full line of high-quality sports nets and accessories, Carron is your one-stop net source. 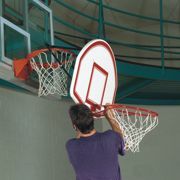 It's possible to change from adult to youth league basketball in minutes with the 6-in-1 Easy-Up Youth Goal. Originally known as a B-B Goal, the updated 6-in-1 Easy-Up Youth Goal is available at Future Pro. This Easy-Up will give you playing heights from 6 ˝ feet up to 9 feet, at 6-inch intervals. One-person installation, no tools required, and it will install on any existing goal, regardless of manufacturer or age. The 48-by-32-inch backboard of high-impact ABS plastic has a lifetime limited warranty. There's a full size rim and shooter's square. 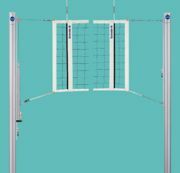 Built to last a lifetime, easy to use every day, Schelde Collegiate 4000 Net System combines ultra-light wear with innovative engineering that has made it one of the most popular volleyball net systems in the sport. Designed to be easily set up by one person in five minutes or less, Schelde's exclusive UnirailTM net attachment system provides quick and easy net height adjustment. TectonTM Duraluminum posts and fully sheathed steel gear linear winch come fully assembled and carry a limited lifetime warranty. Guaranteed net height. Jaypro's Ceiling Suspended Retractable Batting Cage is motorized for ease and convenience. Easily raises and lowers from the ceiling using a drive shaft powered by a 1-HP electric winch, and is key switch operated. The frame size is 10 feet high by 12 feet wide and 70 feet long, and is constructed of heavy walled 2-inch aluminum tube. Choose between a baseball or a multi-sport net. Protect your facility, players, coaches and spectators from harm and make full use of your available inside space. Action Floor Systems has developed AirRide®, a vinyl rollout gymnasium floor cover system that uses a patented air blower to drive a cushion of air that simplifies installation and removal. AirRide's lift effect greatly reduces potential for scuffing and scratching of the floor's surface during either process. Deploying and removing the cover is quickly and simply managed by two people. The AirRide cover vinyl is phthalate-free and is available as a 10-foot-wide, 20.5-ounce seamless sheet to protect floors against damage from tables, chairs, street shoes and other abrasive items.